Anime eyes are one of the most definitive characteristics of the anime and manga drawing style. Depending on the artist and the type of character that is portrayed there are almost countless variations. 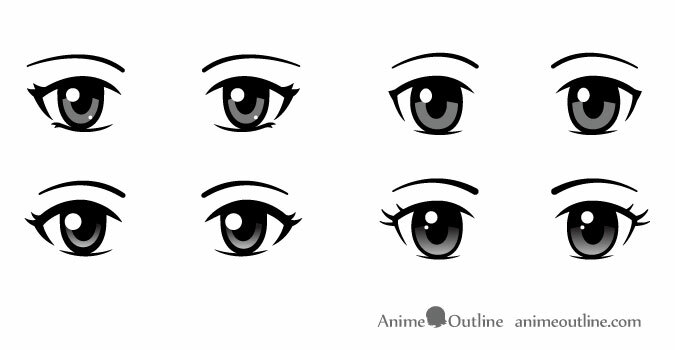 This tutorial focuses on some of the more common types of anime and manga eyes and looks at some potential reasons as to why they are drawn the way they are. 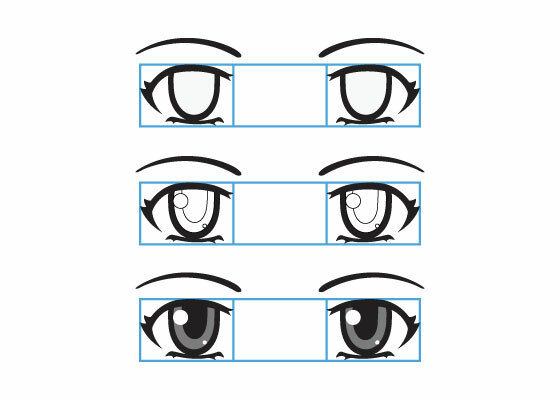 You can also look at the How to Draw Anime Eyes and Eye Expressions tutorial on this site for some more detailed instructions. 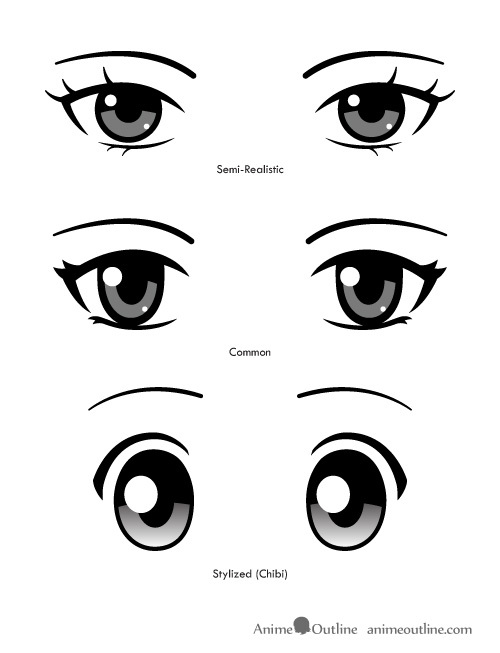 Most anime and manga eyes are drawn in a fairly simplified manner where a lot of the details are omitted. One good guess as to why this is would be that artists have to draw many frames of animation or panels of a manga. Having to draw detailed realistic eyes every time would be far too time consuming. Big eyes are also easier to see in small drawings inside a manga which in turn makes it easier to convey a characters emotional state. Anime eyes tend to consist of minimal parts such as the top and bottom eye lashes, iris and pupil. Instead of drawing individual eye lashes anime eye lashes are often drawn as one whole shape or with just a hint of a few lashes (depending on the style). You may notice that anime eyes are often drawn vertically stretched. One good reason for this might be that if you draw large eyes and draw a round realistic iris/pupil you will end up with a lot of space between the top, bottom or both parts of the eye. This space can give a character a scared or crazy look. Alternatively if you were to draw a round iris that is large enough not to cover this space then it would fill almost the entire eye and would again look quite odd. By stretching the iris and pupil artists are able to draw large eyes and still make a character retain a normal eye expression. You can also see this in other styles outside of anime and manga. This style portrays the eyes in a semi-realistic fashion. For this style draw round irises/pupils and draw the eyes a lot closer in proportion to real eyes (though still larger). 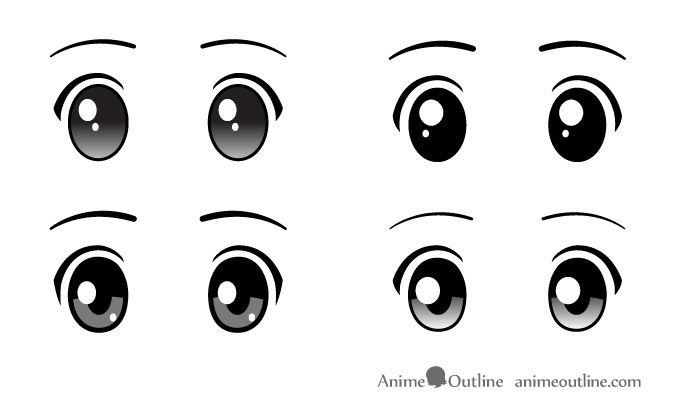 The most common style of anime eyes. In this style draw the eyes significantly larger than real eyes. You can give just a hint of the eyelashes. The characters that are drawn in this style are often know as “chibi”. These have tiny bodies and huge heads with giant eyes that can cover most of the head. The most common example of these would be in video games (especially old and retro styled games). In this style draw huge eyes in relation to the rest of the character. Draw almost every part of the eyes vertically stretched (the reflection can be just about any shape). Most of the details of the eyes when drawing in this style can be omitted. You can even avoid drawing the bottom eyelashes. Please keep in mind that the above advice is just basic guidelines. You can mix and match elements from different styles add or remove details, gradients, reflections, etc… Try different things and see what works and what doesn’t. 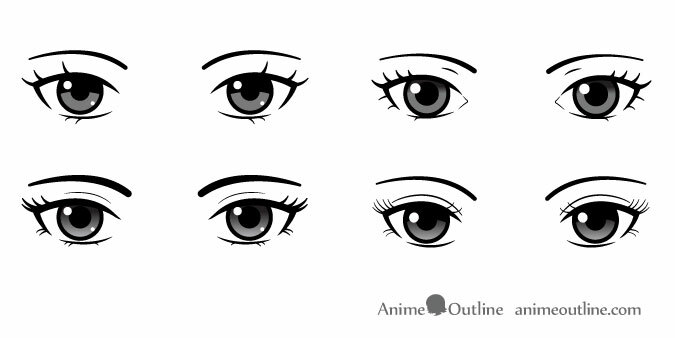 You may also want to check out How to Draw Anime Eyes From Different Angles and How to Draw Anime and Manga Eyes to Show Personality tutorials.